Laidig Systems, Incorporated provides custom-engineered bulk storage and reclaim systems that are exceptionally durable, reliable, with fully automated, state-of-the-art control interface technology. Laidig Systems is known throughout the industry for its rugged, high-quality solutions. Laidig excels in innovative, effective designs that are customized to store and reclaim bulk materials with poor material flow characteristics or other special handling requirements. Some of these materials include grains, grain meals, biomass (i.e. wood chips and pellets), trona, crushed coal, FGD gypsum, limestone, fly ash, cement, powders, and a variety of recycled materials. Laidig has pioneered the bulk storage and reclaim industry for over 50 years, and is recognized as the industry leader for screw-type bottom reclaimers in silos, domes, and open piles. Laidig engineers, fabricates, installs and services, and markets its bulk storage and reclaim systems to provide a complete material- handling package that includes: the reclaimer, storage vessel, and peripheral conveying and handling equipment. Laidig's highly- qualified team has the knowledge and expertise necessary to provide solutions for some of the most difficult material handling challenges, especially with grain and grain meals. One of the Laidig reclaim systems that excels with these types of materials is the CleanSweep. The Laidig CleanSweep system is ideal for high-volume storage of free-flowing materials, such as dry grains and pellets. The CleanSweep is a wheel-supported reclaimer that provides total clean-out with zero personnel entry into the bin. The unique reversing capability of the CleanSweep enables maximum operational flexibility. CleanSweep systems are available in corrugated bins, steel tanks, or monolithic concrete silos in diameters up to 200 feet. Designed specifically for free-flowing and semi-free-flowing materials, the Laidig CleanSweep is the ultimate bin, silo and dome clean-out solution. It allows for more-frequent inventory turnover eliminating dead zones and minimizing waste caused by mold and infestation. The CleanSweep’s fully-automatic, push- button clean-out operation reduces labour costs while increasing net profits. High-volume discharge is achieved by combining free- flow through draw-downs with consistent, high-delivery from the reclaim auger. The Laidig CleanSweep provides the highest level of operator safety by avoiding many of the health and safety risks of silo entry. Its zero-entry clean-out operation eliminates employee exposure to harmful dust, chemicals and the risk of material engulfment. The CleanSweep is ‘confined-space friendly’, with minimal maintenance required, and with serviceable components in easily-accessible locations. Laidig’s CleanSweep leads the industry by offering key features that add value and flexibility. Its reversible sweep operation allows for greater flexibility when partial clean-out or unexpected silo fill is required. 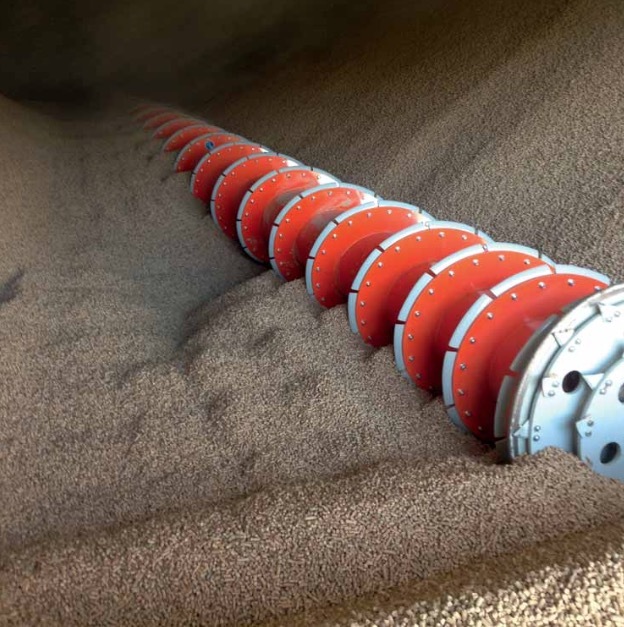 In the case of upset material conditions or a material avalanche, the sweep auger has the ability to reverse out of the material and then continue normal operation. The CleanSweep features a heavy-duty, rigid auger design coupled with advanced-torque sensing controls to ensure the reclaim auger remains at floor level while advancing at the appropriate rate. These torque-sensing controls and rigid construction eliminate auger climb and maximize efficiency by allowing the sweep auger to cut (not climb) into the stored material. CleanSweep is built to perform under upset material conditions or collapsed material piles. For efficient operation, Laidig utilizes high-power hydraulic motors for the CleanSweep’s reclaim and advance drives. This hydraulic system has an integrated, automatic dual-speed reclaim drive, allowing for greater operational flexibility under harsh conditions, frequently eliminating the need for costly aerated floors and dryers. All drive components are protected from the stored material to ensure longevity of equipment and minimize the possibility of material contamination. The Laidig CleanSweep also offers an intelligent, fully automated, push-button operation utilizing Laidig’s LMITM(Laidig Machine Interface). The LMITM provides the operator with maximum control and flexibility while ensuring the reclaimer is running in a safe and efficient manner. It allows full interaction and monitoring of the reclaimer’s status and operation in a graphic-rich display. The LMITM provides an interface to safely control the CleanSweep reclaim system, which can be integrated with various types of customer control systems. It can also include remote access capability for monitoring or troubleshooting the system off-site.